These are some of my favorite movies. The Drosophila (fruit fly) embryo syncytial divisions. 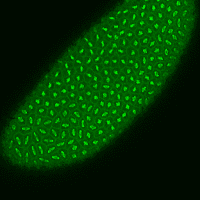 This is an embryo from a line expressing a green flourescent protein attached to the tubulin protein - so you can see microtubules and mitoses. They are all perfectly synchronized and are mesmerizing.